Paradiso issue #3 hits stores February 14. Centuries after the Midnight Event completely transformed the world as we know it, Paradiso follows “Runaway Jack” Kryznan as he desperately seeks answers to a childhood he cannot remember, in a city that follows rules of its own. Paradiso is the promised land for anyone suffering in the wasteland surrounding its walls, but within them, nothing is as it seems. In issue #3, we begin to fully understand what that means. The last two issues set up the exposition of the story and dove into the origins of the Midnight Event. Now we get to learn about the Arbuck settlement, how it came to be a place of salvation, and the mythos of the Guardians. Once again, Paradiso questions the godliness of technology. Humans in this universe have put so much faith into the workability of electricity and advanced technology that it’s become their only salvation, even years after everything shifted because of their hunger for its power. “Runaway Jack” remembers nothing from before the night his life changed forever — a night the city of Paradiso seems to remember as well as he does. Still, each time he gets even remotely close to an answer, he stumbles upon several new questions instead. Jack meets new characters in issue #3 who seemingly want to help him, though there’s some suggestion that it might be too late. The world continues to shift around him, which is surely as dangerous as it seems. Meanwhile, characters that were introduced in Paradiso #1, who crossed paths with Jack and set several of the background plots in motion, are in equally dangerous territory. The connections between these characters aren’t yet clear, but one thing certainly is. 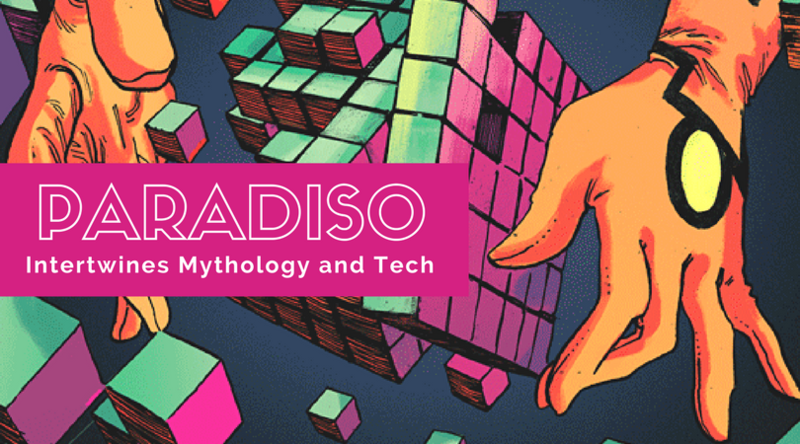 Although Paradiso, the comic, is deeply entrenched in the paradoxes and pitfalls of humanity, Paradiso, the city, cares not for the whims of human beings. The creative team behind this story are weaving a much deeper, darker plot through the series than is currently visible on the surface. Each issue introduces a new piece of the puzzle, leaving us trailing after Jack and feeling equally flummoxed — though Ram V’s use of dramatic irony is much appreciated, since it shows us just how deep Jack is in over his head. 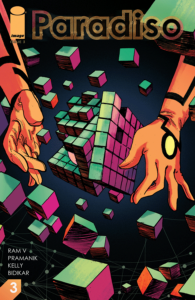 Paradiso #3 pushes the plot along at a steady clip, but establishes new visual elements that weren’t as heavily relied upon in the first two issues. The narration shifts between dialogue and inner monologue more, with deeply contrasting colors illustrating the difference between the two. Devmalya Pramanik’s artwork is absolutely superb this issue, and Dearbhla Kelly’s colors are so sublime they’re quite literally breathtaking. This issue digs its heels into the violence of this world, complete with explosions, and it’s really obvious that both artists had a ton of fun rendering that on the page. Likewise, Aditya Bidikar’s letters seem almost 3D, an effect that is deeply disturbing in many, many instances. This issue is easily the best in the series so far. As we move away from the exposition and begin to ask more pertinent questions about just how much fuckery is truly happening in this post-apocalyptic world, the fun really kicks in. It’s obvious that there’s a well-laid plan in place for the plot of this story, and going along for the ride is absolutely incredible. Keep your eye out for the mythological references in Paradiso #3 — I think they lay more groundwork for what may come to pass than anything other Easter Egg that’s been planted so far. As with every issue of Paradiso, the nuances of issue #3 are more noticeable upon re-read. The pace is picking up as the series runs pell mell into what seems like an all-out war, and while I have no idea what Ram V, Pramanik, Kelly, and Bidikar have planned for the duration, I’m definitely in it for the long haul. Paradiso issue #3 hits comic shops February 14. You can order back issues online through Image Comics. In Full Bleed received an advanced copy PDF of the issue from the author for review purposes.